Divnick Iron Hybrids - Join the Sensation! On our main Telescopic Page, we describe how drivers and putters are the extremes in terms of length, weight, shape, and purpose. The Whole-In-One Adjustable can't do those jobs as well because it is most like an iron and its distance is limited by its 4-iron length shaft. Hybrids are the next step in from drivers, in terms of shaft-length and hitting distance. Hybrids produce more consistency off the fairway and out of the rough. They have telescopic shafts, and are also available with one-piece shafts for those who aren't concerned with portability. Iron hybrids are one of the hottest topics in the golf equipment industry today. They combine the characteristics of a hollow driver with the loft of an iron. The result is nothing short of sensational. Using hybrids is one of the easiest way to shave strokes off your score. The hybrid sensation started with 3 and 4-iron lofts of 17 to 25-degrees with brand names that conjure up escaping from trouble, rescue from a bad lie, and providing medical aid to an otherwise difficult shot. The shell-construction allows a thinner face and MUCH more weight around the edge of the perimeter than cast or forged blades. They have a significantly lower and farther back center of gravity to more easily get the ball airborne and provide more back-spin. They also provide a significantly different visual profile as you address the ball and look down at the significantly larger profile. Rather than a thin blade, they show a larger deeper head that creates extraordinary confidence. Confidence results in relaxation and tempo that average players just don't have with traditionally-shaped irons. "I like what your company is doing by building clubs for average golfers. I use your high loft Big Stik driver, 20-degree Little Stik 3-wood, and have now played a few rounds with your 3 and 4 loft hybrids. They are easier to hit than my Ping 3 and 4 irons, and they definitely go higher which I like. I'm ready to try the 5-loft. Please get one built as soon as possible. Thanks." In an article by Tom Wishon, PGA.com's Technical Advisor, he says, "There is one, and only one, reason to have hybrid clubs in your bag: to replace those tools of torture, the long irons." The goal is NOT to have a hybrid that hits farther than a perfectly-struck 3-iron. The goal is to have one that will hit the same desired distance--CONSISTENTLY. Too many strokes are lost with mis-hit long irons. Hybrids are performing stroke-saving surgery for many weekend duffers who have NEVER been able to count on their long irons. The most popular hybrids are 3 and 4 iron lofts which replace the most difficult irons to hit. There is no longer a need to struggle with those difficult irons. When a shot calls for that distance, you can pull out your Iron Hybrid and let it fly! We encourage you to give it a risk-free trial. It will change your game forever. Start with a 3-loft, and experience a new sensation on those long shots. While shorter irons are not as difficult to hit as longer clubs, DivnickGolf offers hybrids in ALL of the iron lofts. Since the goal in golf is to use as few strokes as possible, having a full set of hybrids just makes sense. Make every shot an easy shot. Give yourself every opportunity to hit it pin-high and tight. Pick a line and hit it. Length: Our hybrid shafts are about 1/2" longer than modern irons of the same number. That generates a little more club-head speed, and allows you to hit a little farther if you wish, or choke down a little for precisely the same distance. Custom lengths are available upon request. If you are wondering about how the collapsed hybrid fits into your suit case, the following image will help. If you also have one of our T&F Drivers, it is longer than all the other telescopic clubs (except the chest putter) so your hybrid will easily fit. Shafts: Most of our customers get telescopic shafts. But we also offer them in one-piece True Temper steel shafts. Because hybrids are designed to replace irons, not fairway woods, we don't recommend graphite shafts on hybrids. Graphite shafts are lighter and allow longer lengths to generate more club-head speed when maximum distance is the goal. But irons are not used for maximum distance. They are designed for precise distance, and steel shafts are more accurate. They are also better for maintaining their path through thick rough. Timing: Hybrids are available in both right and left handed options. We inventory right handed 3, 4, and 5 iron lofts and can usually ship those within 1 business day. It takes about 2 weeks to order and ship other head options. You may want to consider head covers to protect the beautiful painted finish on your hybrids. These durable head covers are numbered which makes it easy to pick the right club out of your bag. Hybrid head covers are $5 each if ordered with your club(s), and $10 each if ordered separately. If you have never experienced a hybrid iron, we recommend you try a 3-hybrid for shots when you would normally use your 2 and 3 iron. You will be amazed at how easily it hits the ball in the air, and straight at your target. If you like that loft, you will probably want to add the 4 and 5 hybrids and maybe some others. Hybrids hit EVERY loft more consistently than a normal iron. This simple change of equipment is one of the easiest ways to knock strokes off your score. The normal cost for our Divnick Hybrid Irons is $169 with a two-piece telescopic shaft, minus $20 if you get it with a one-piece steel shaft. Special April Discount: Until the last day of April , you can get hybrids for a $30 discount which takes the price down to $139 ($119 for a non-telescopic shaft). 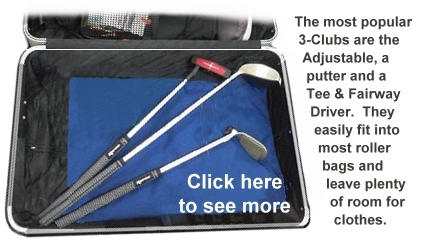 And we take another 10% off if you order 3 or more clubs!